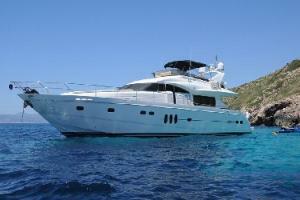 Princess 23m - Stylish, classy yacht. Perfect for every occasion. Comes equipt with jet rib, water toys and fully air conditioned for maximum comfort. 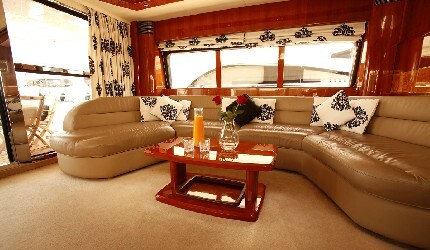 She sleeps 8 people & 2 crew and can accommodate 12 for day trips and is fully air conditioned throughout. She has 4 cabins including a stateroom, a VIP room and two twin/double rooms all boasting their own en-suite toilet and shower (the stateroom has the added luxury of a full size bath and power shower) Access to the crew's quarters are via a separate entrance from the side deck. The crew also have their own bathroom facilities. The stateroom and VIP room have LCD TV/DVD/CD radio and the other two cabins have LCD TV/BluRay DVD/Playstation 3. A library of Books, CDs and DVDs suitable for adults and children is available for your entertainment during your stay. 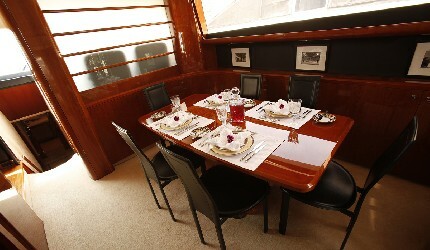 The saloon is the height of luxury for relaxing and entertainment. It includes 2 large sofas, a dining table for 8, a cocktail cabinet with refrigerator and a 42 inch LCD TV which lowers into the cabinet out of sight. There is also a DVD and Bose surround-sound system. The Bose system has iPod connections and a Nintendo Wii is also installed. Outside on the fly bridge this beautiful yacht has a king size double sun lounging bed, a wetbar, sink and electric barbecue. It has a jet tender for those all important visits to the beach and includes water skis, donuts and snorkelling equipment. On the front deck you will find a full width sun bathing area with custom made cushions, where you can relax in style and comfort. 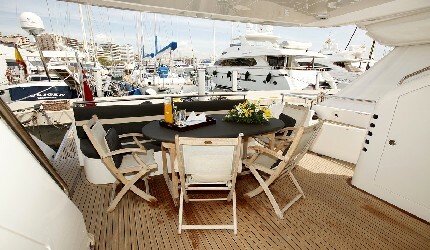 On the rear deck you will find an 8 seat dining table, the place to see and be seen (under cover) together with additional sunbathing area with access to the bathing platform and dive ladder. From this point you can board the jet tender and visit the beaches, coves and restaurants or simply enjoy a myriad of water sports. There is also a fully equipped kitchen and utility/laundry room on board where the crew can take care of any domestic requirements that you may have.